I got one from the Auburn store. Not bad for $30. I can see why people unpick the cross stitching, a lot of loft is lost with all those extra stitches. A friend of mine couldn't find any at the Casula store. Another friend is going to purchase a few to use as travel blankets for plane trips. Wow, just came back to this thread, glad they made it to Au. If anyone can help me out by sending one to WA for me, please PM. Got myself one yesterday to try out. I haven't unpicked any of the horizontal stitches and I'm not sure if I will, but I sewed in a footbox. I might add some snap closures at the top and a draw cord to secure it around my neck better depending on how it goes when I test it. Had a closer look at my quilt last night. I think I will unpick the stitching as the one I got has a very uneven distribution of down. One corner has virtually nothing in it, whilst other squares seem to have too much. Spent some hours last night unpicking every second row of stitches across the quilt. It was worth the effort as the amount of extra loft is significant. Considering doing more unpicking to create zones ie.torso, legs and feet. I ended up unpicking all of the horizontal seams on mine. It really increases the loft. In addition to this I added two strips of velcro above the footbox so that I can secure the back of it around my body and I added a draw cord at the neck. Final weight in the stuff sack is 463g. Any idea if these are still available at the Melbourne Docklands store? The answer to my question is yes, they had 342 in stock this morning, now less 2 that I bought. Strider, Costco better allocate a special shelf for your MYOG modification. Nice job! GPSGuided wrote: Strider, Costco better allocate a special shelf for your MYOG modification. Nice job! I actually haven't made a start on it yet. I do have the hardware from Simon though. Maybe this weekend if I have time. It did get a run regardless a couple of weeks ago by my 4 year old son. 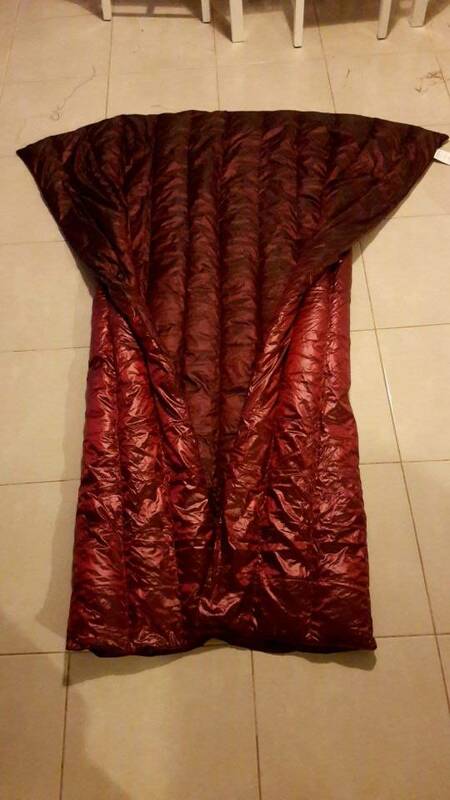 Used as an open blanket on top of a Macpac Escapade 700 (2C EN comfort rated) and he was very warm down to nearly freezing with a Prolite 3 underneath. I'll give it a go as a standalone quilt myself once the weather warms up again. Sounds like I'll need to remember to pick one up next time, before they run out. Does anyone know if the Canberra store has these in stock? Making the trip there on Monday. Auburn seemed to no longer stick it as of last week. GPSGuided wrote: Auburn seemed to no longer stick it as of last week. I can confirm they are available at Casula and they had several cartons of them. They are next to the ski gloves. Maybe they moved the remaining stock from Auburn to Casula. McNazgul wrote: Does anyone know if the Canberra store has these in stock? Definitely no longer there in Auburn. Docklands still had heaps when I dropped by a couple of weeks ago. Strider wrote: Docklands still had heaps when I dropped by a couple of weeks ago. Docklands sounds good, may have to drop in and have a sqiz. Ok, finally found it at Auburn. Saw a customer at the check-out with two and asked where she picked it up. Apparently the store placed them amongst all the other beddings than with winter sports gears. Plenty left. The only early comment is, the stuff sac is a big generous. Could squeeze it a lot tighter. Strider wrote: A short zip and drawcords top and bottom should make it quite functional. Considering also adding flat buckles to fasten down to my mat but I'll see how it all fits first. Mine is the same colour. A question, was any reason why you chose to have the shinny side facing out? For heat reflection, would it be 'more' logical to have it reflect towards the inner? Or did you think it's more stain resistant? Its the same fabric on both sides, just different colours. I havent put it together yet but aesthetically I do prefer shiney side out. I'd agree from aesthetics POV.